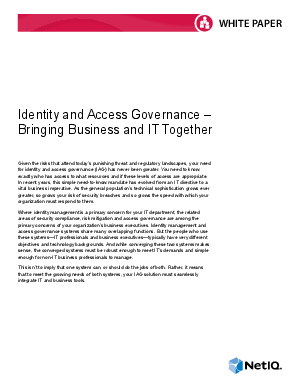 Given the risks that attend today's punishing threat and regulatory landscapes, your need for identity and access governance has never been greater. You need to know exactly who has access to what resources and if these levels of access are appropriate. In recent years, this simple need-to-know mandate has evolved from an IT directive to a vital business imperative. As the general population's technical sophistication grows ever greater, so grows your risk of security breaches and so grows the speed with which your organization must respond to them.